Due to an economic climate better than the national one and a generally young demographic Utah has no shortage of high growth areas and abundance of new homes. To fill this demand there are a plethora of Utah home builders across the state. 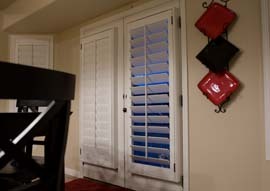 So while there is no question that our specialty and focus is plantation shutters, we’ve compiled a list of some of the biggest home builders and provided a few details about each one for those looking for some of Utah’s home builders. The majority of the biggest home builders in Utah operate along the Wasatch Front where the majority of Utah’s population resides. Though there are a handful of big home builders in other parts of the state as well. We’ve noted below in which area each home builder primarily operates in by the abbreviations below. We hope this has helped in your search for your new home. Happy hunting! Ivory Homes by most measures is Utah’s biggest home builder. Not only are they the biggest home builder but have been every since 1990 and quite frankly lap the competition in number of homes built. Having started in humble beginnings over 40 years ago Ivory has established itself as the biggest home builder in Utah for nearly three decades. The sheer quantity of homes Ivory builds means that they offer homes in more than 50 locations across the Wasatch Front as well as St. George. Locations along the Wasatch Front stretch from Centerville in the North to Spanish Fork in the South with home developments in essentially every city in between. D.R. Horton unlike Ivory is a national home builder stretching across both the Southwest and Southeast as well as the upper Midwest. Founded in the Dallas/Ft. Worth area and in business for more than three decades DR Horton boasts to be the largest home builder in the United States. Horton offers a handful of Utah locations which are found in Orem, Lehi and South Salt Lake including Bluffdale, Riverton and Herriman. Garbett Homes was founded by Bryson Garbett as a recent University of Utah graduate over 30 years ago. Today they build homes across the Southwestern United States (Utah, New Mexico, Idaho, Wyoming and even Missouri) as well as in Mexico City, Mexico. Utah communities are primarily concentrated along the Wasatch Front in Sandy, South Jordan, West Valley City and Farmington. Garbett builds all types of homes including townhomes, traditional homes, condos, luxury homes and even solar powered homes. Based in Orem, Utah Edge Homes boasts to be the fastest growing home builder in Utah. With over 25 years of building homes Edge’s Utah locations are mainly located from South Salt Lake (with a few exceptions of homes in the Taylorsville, Midvale and even Heber areas) to Spanish Fork with many locations in the high growth areas of Lehi/Saratoga Springs/Eagle Mountain as well as a number of locations in the Springville to Spanish Fork corridor. Richmond American Homes have locations across the United States with main areas being the Southwest and Northeast. Richmond has been around for approximately 30 years and offers mortgage and insurances services in addition to homes. Utah locations for Richmond aren’t as many as those discussed above but do include Heber City, Pleasant Grove, the West Lehi area, South and West Jordan and Farmington. Castle Creek Homes has been building homes in Utah for almost 2 decades. Castle Creek mainly builds in between Kaysville and Ogden primarily in the Clearfield, Layton and Roy areas. Founded by Rick Salisbury in 1989 Salisbury Homes has been serving Utah homebuyers ever since. Salisbury homes focus on building homes on schedule and can complete homes in 30-45 days. Their main locations stretch from American Fork to the Payson area including homes in Lehi, Saratoga Springs, Spanish Fork and Springville. Additionally, they build quite a few homes in Southern Utah in the St. George area. Destination Homes (WF – N) Destination Homes is one of the newer home builders in Utah having been founded by David Bailey and Brad Wilson in 2001. Their focus is on building homes but they also build town homes. They primarily build homes which stretch from Daybreak in South Jordan to Pleasant View near Ogden. Henry Walker Homes really is one of the newest home builders in Utah since opening their doors in October of 2009. Henry Walker’s primary areas of home development are in Davis (Farmington, Fruit Heights, Kaysville and Layton) and Salt Lake counties with additional homes being built throughout the St. George areas. FieldStone has been building home since 1981 in three states – California, Utah and Texas. In Utah FieldStone builds homes along the Wasatch Front from Centerville to Springville and Tooele to Kamas. Founded by two brothers, Jay and Quentin, in 1957 Ence homes continues today under ownership of the Ence family. Ence Homes is one of the biggest builders in Southern Utah with homes spread in and around St George as well as Mesquite, Nevada. Sierra Homes has been building homes since 1998 and was founded in Logan, Utah. Sierra has homes stretching from Santaquin to Southern Idaho and even some in Wyoming but focuses mainly on Northern Utah in areas including Ogden, Tremonton, Logan and more. Cameo Homes started in 1976 and has since done 110 million in sales! Located in Salt Lake City, Cameo primarily builds homes in five counties: Davis, Summit, Salt Lake, Wasatch and the Northern part of Utah County; though they do build in other counties and even in neighboring states on occasion. Due to the way Cameo is structured as a business they do everything from buying, selling, building and developing properties. This means that they’ll build your custom home on land you own or something they have or own themselves.